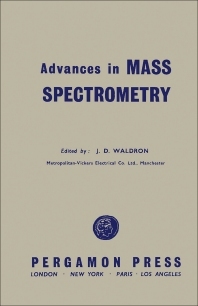 Advances in Mass Spectrometry documents the proceedings of a Joint Conference on Mass Spectrometry held at the University of London, Great Britain on September 24-26, 1958. This compilation reviews the instruments, techniques, applications, and major developments in mass spectrometry over the past years. The topics discussed include the performance and image error correction of the new stigmatic focusing mass spectrograph; correction of second order aberrations in inhomogeneous magnetic sector fields; and high sensitivity solid source mass spectrometry. The isotope dilution analysis; digitization of mass spectra; ionization potentials of alkyl and halogenated alkyl free radicals; and negative ion formation and electric breakdown in some halogenated gases are also elaborated. This book likewise covers the mass spectrometer as a geological instrument and absorption and desorption of gases in the ionized state on metal and glass surfaces. This publication is a useful reference to students and researchers conducting work on mass spectrometry.